Hey everyone, happy Saturday! 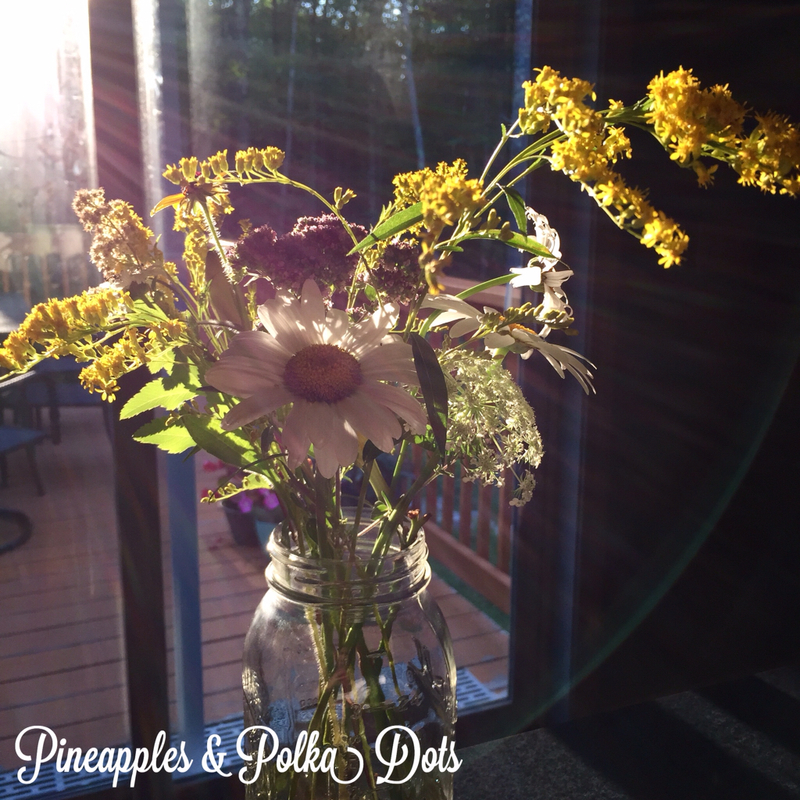 I wanted to share a super quick summer decor project from a few weeks ago. I had been wanting to add some more summery touches to our home, but without having to go out and buy new things. I'm always a fan to shopping my house first, both to save money and because I live 30 minutes or more from any craft or home decor type stores. I know- tragic, right?? 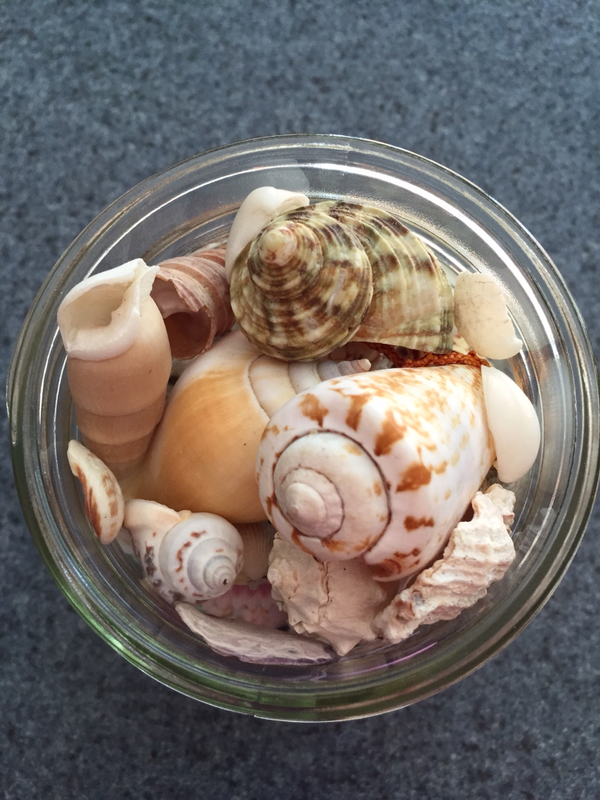 I've had this bag of beach shells kicking around, and have been looking for a way to display them. They were given to my by my aunt and uncle who, at the time, lived in Florida. 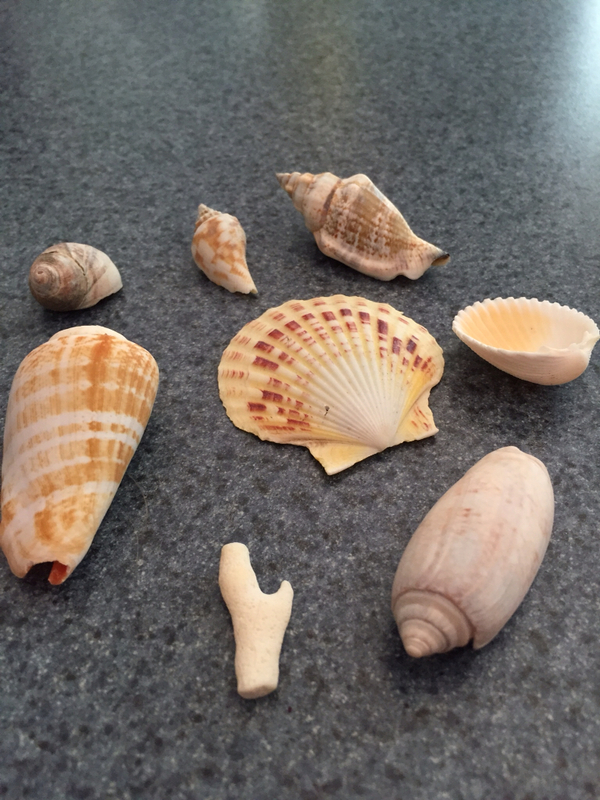 In case there's any confusion out there, we don't have most of these types of beautiful, colorful, and detailed shells at the beach in NH. I didn't want to turn them into anything permanent, since I have a limited quantity, and hadn't seen anything I really loved enough to take the plunge. 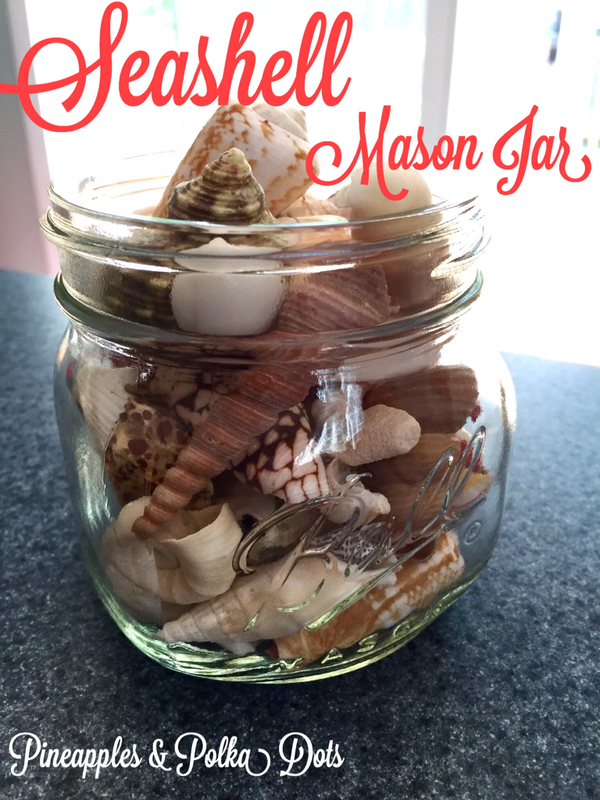 I ended up grabbing one of these mason jars and got to work on arranging the shells inside. I tried to include lots of textures and colors, and also different shapes. I'd suggest adding the small ones in at the end, since they fill in the gaps. 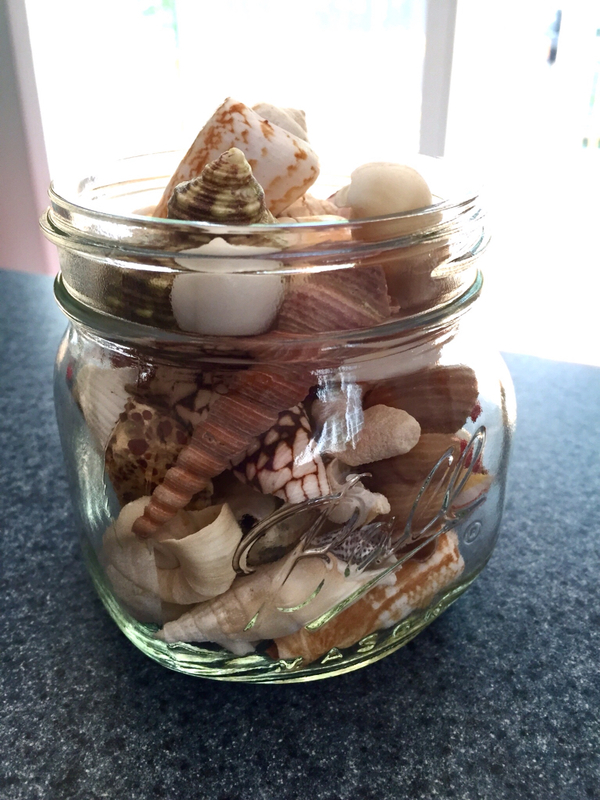 I kept out a few of the larger shells to put on the shelf around the jar, too. This is such a simple project, I feel silly even sharing it, but I am so glad to have a way to display the shells that I love, and liked that this gave me the push I needed to just use them for something pretty. I might find a project that's more permanent in the future, but for now, this was just what I needed! It's summery, pretty, and easy. 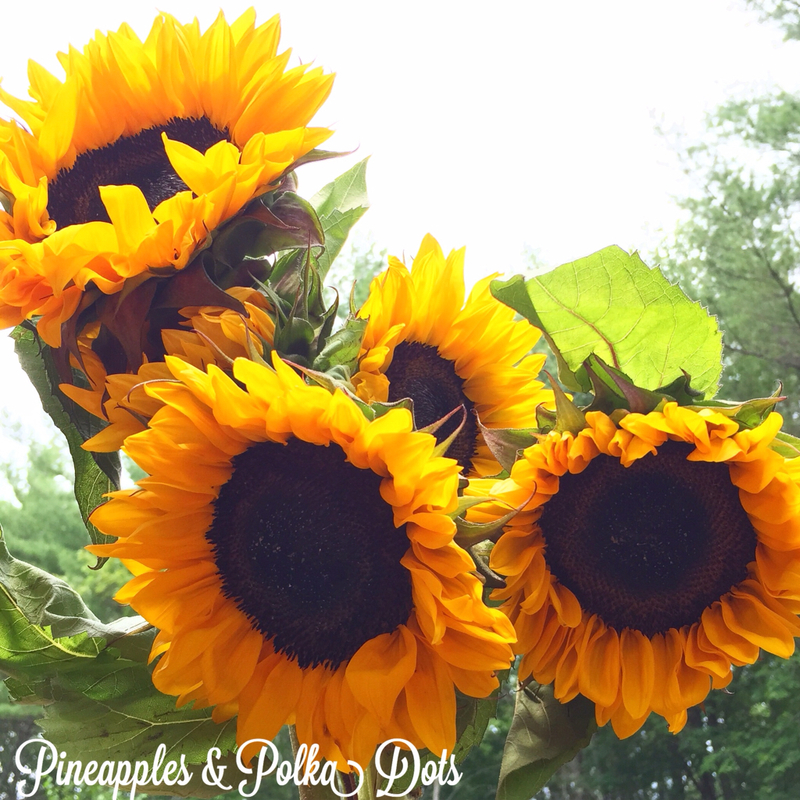 Another super simple, but super summery love of mine are sunflowers! I picked up these beauties for my mom yesterday, as it was her birthday. I think I'll be picking some up for my dining room table the next time I'm at the store! 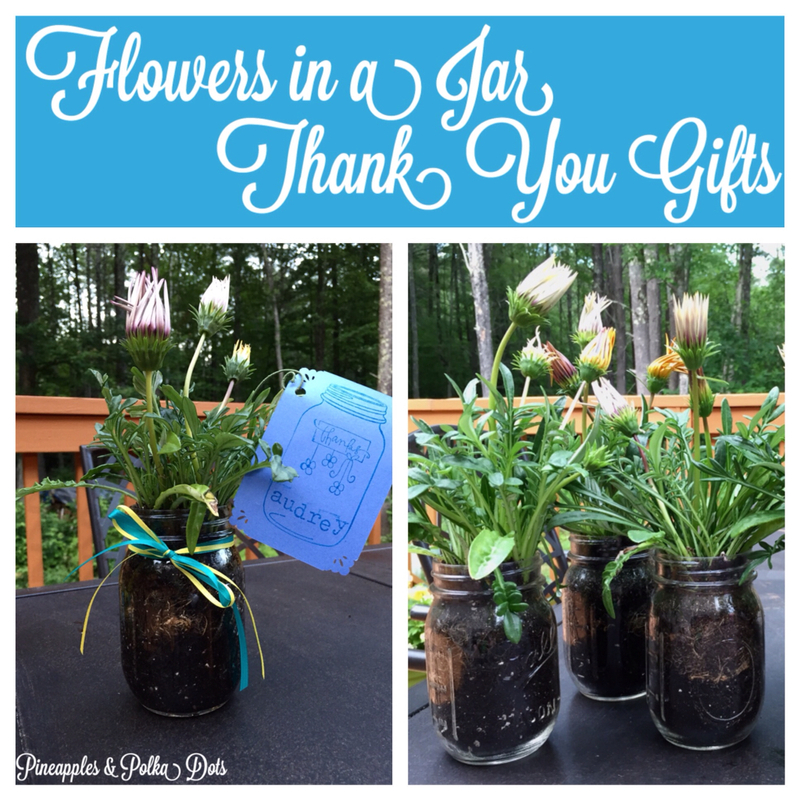 I've been loving collecting (mostly) windflowers in mason jars, too. 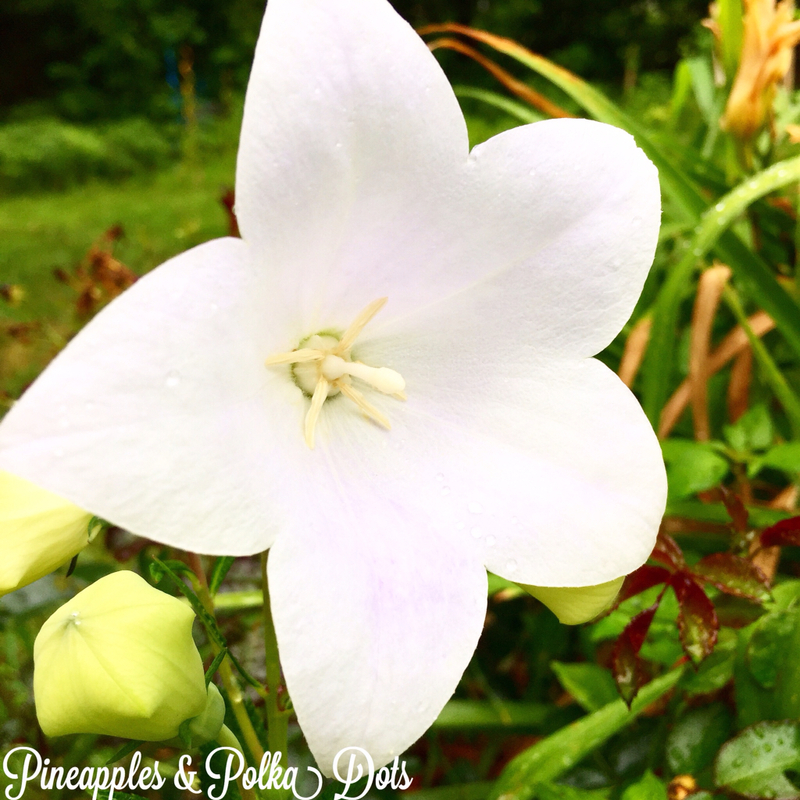 We have lots of different types of flowers around our yard, and along the driveway, so it's fun to see what pops up or blooms each week! What's your favorite easy summer decor project? 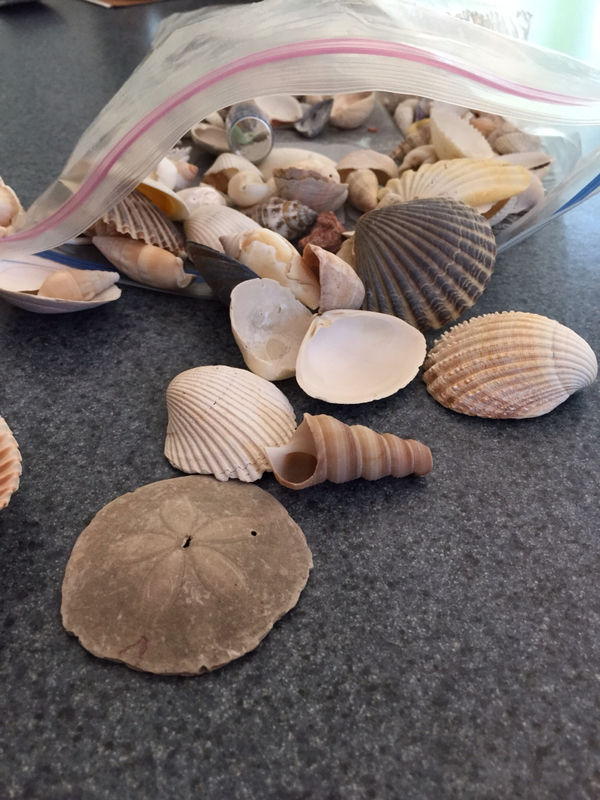 What do you do with the shells you collect? Any suggestions for things to make? So, what are your weekend plans? We've been enjoying the cooler weather, finally, and have been able to get outside more! Enjoy! 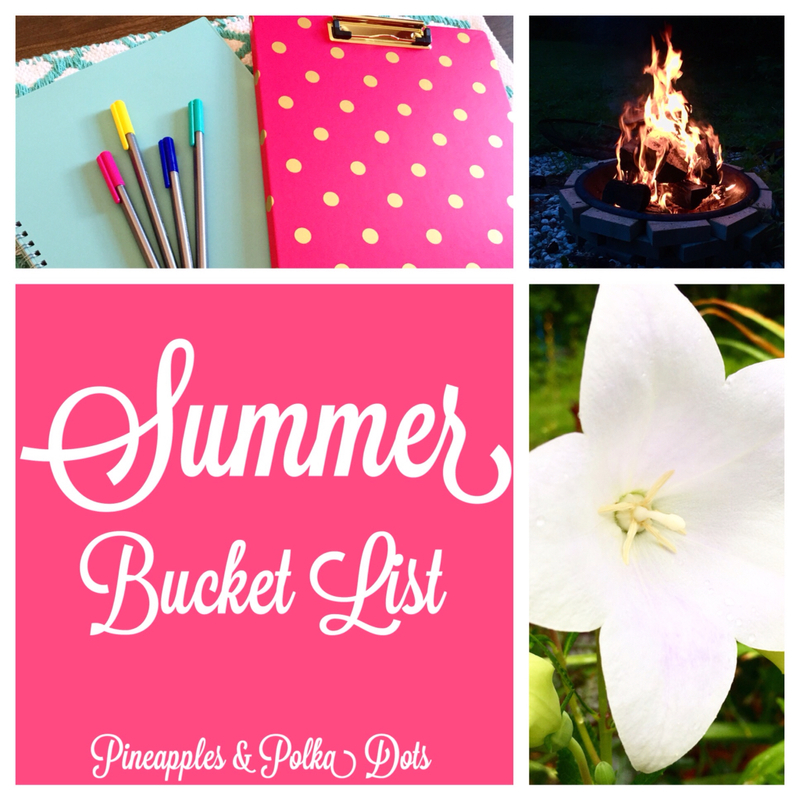 Summer Bucket List: What We've Done, and What We're Hoping to Do! Happy Sunday! I hope you've all had a great weekend! 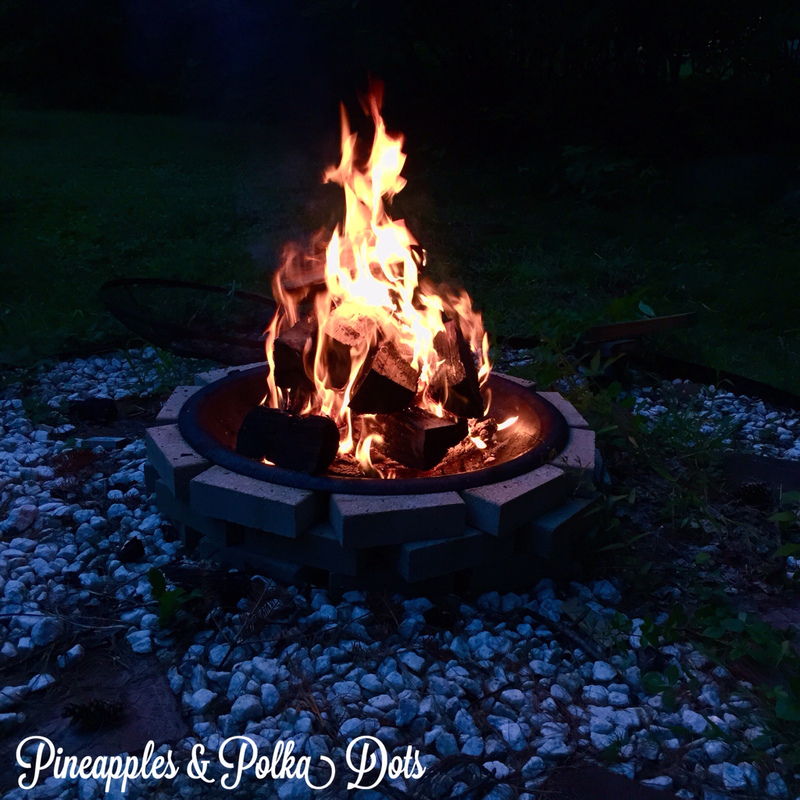 Ours was filled with family, cookouts, campfires, relaxing, and getting some items crossed off of my to do list. First off, one thing I look forward to, NERD ALERT, is buying a new planner. I couldn't live without a paper planner. In fact, the one year I tried to go digital, and use my iPad and iPhone to keep track of everything, I ended up with my life covered in sticky notes. While I love sticky notes as much as the next girl, it was a pretty unorganized system. I went back to using a paper planner quickly, and haven't looked back. I love all of the beautiful options out there, but I have typically used a relatively inexpensive planner in years past, and they've worked out just fine. Once I start filling it in a bit, I'll share my system with you all. Exciting stuff, I know! ;) If you're a planner lover, though, you totally understand. I can't be alone here, right? 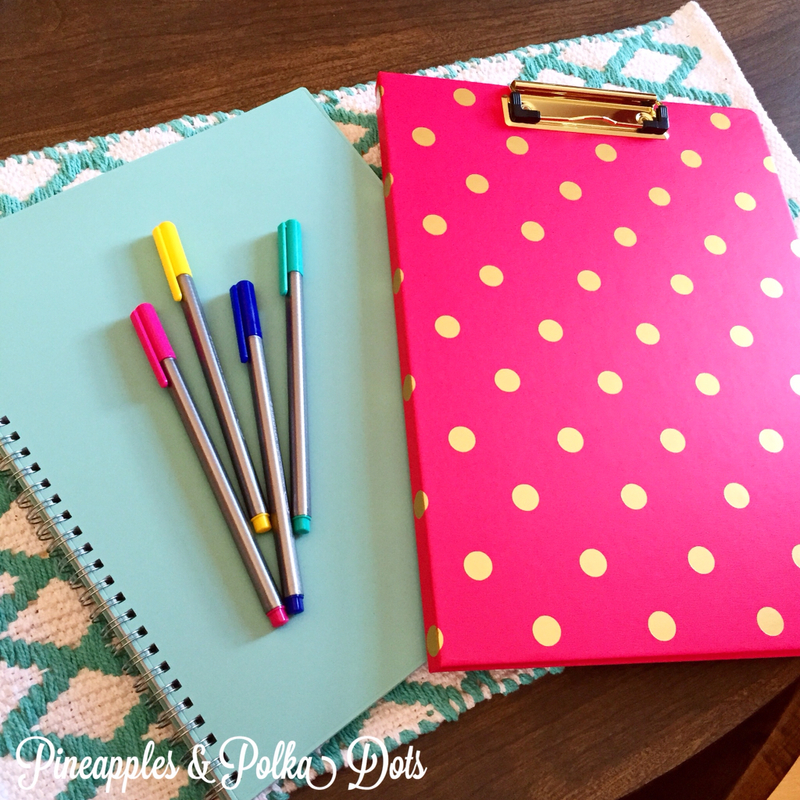 I grabbed this one, along with this amazing hot pink and gold polka dot clipboard/notebook, and and so excited about getting organized all over again! I'm a teacher, so I live in a summer to summer calendar year when it comes to planners. Another thing I love to do during the summer is go hiking, which we've already done a bit of. I am looking forward to some more hikes, which are in the works. You can read about our adventure here. One thing we've done every summer is take a vacation of some kind. We haven't ever done anything really big, but we enjoy taking a small trip each summer to get away and explore somewhere new (or revisit somewhere we adore!). Before we were dog parents, we had more flexibility, but since we've had Lucy, we have always tried to include her in our adventures. For the past two summers, we've rented a camp a few hours away with some friends and also my sister and her boyfriend. We have loved renting a home with a kitchen, real bathroom, laundry, etc, and more privacy than a campground, and it's worked out to be very inexpensive! This year, we aren't doing that, but we are talking about planning a mini getaway. 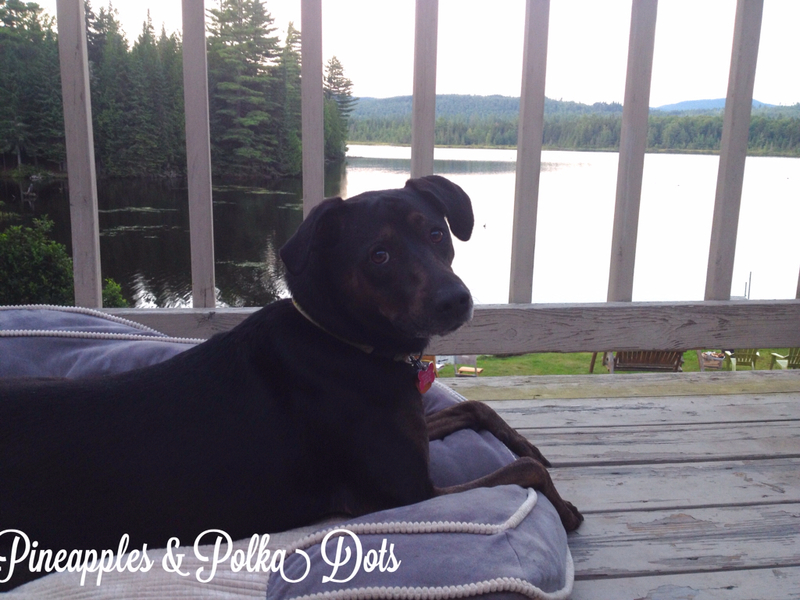 I had heard about the idea of dog-friendly hotels from a friend, and also a couple of blogs. I had no idea they even existed! 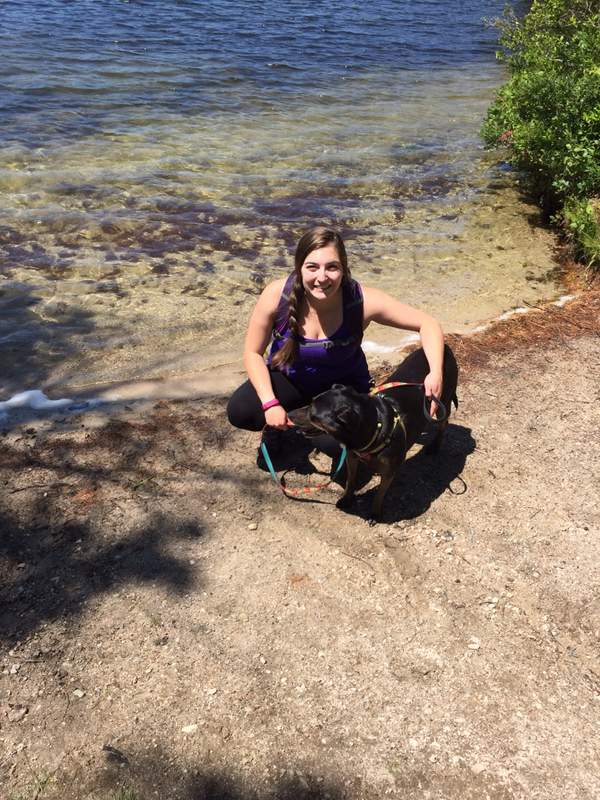 We're talking about choosing one and taking off for a couple of days, to find great places to walk around, maybe some hiking, dog-friendly restaurants, and maybe the beach! I'll be sure to let you know how it goes. 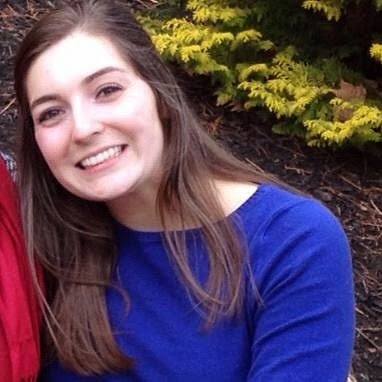 In the meantime, this girl is pretty pumped about the idea! 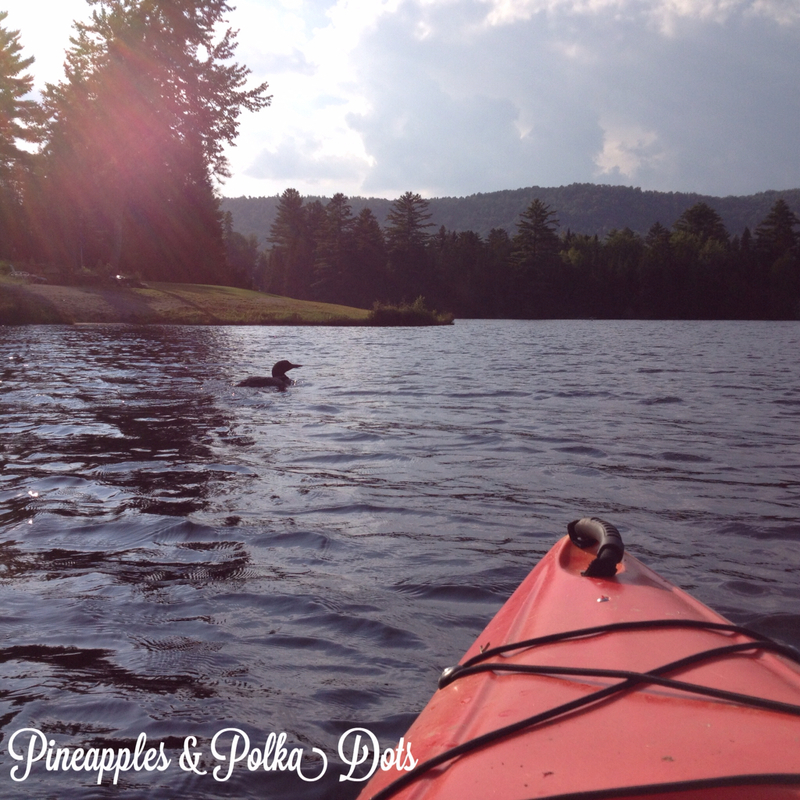 Another thing we love to do during the summer is kayak. We haven't been yet this summer (how is this even possible!?) but we always make a point to go a few times. 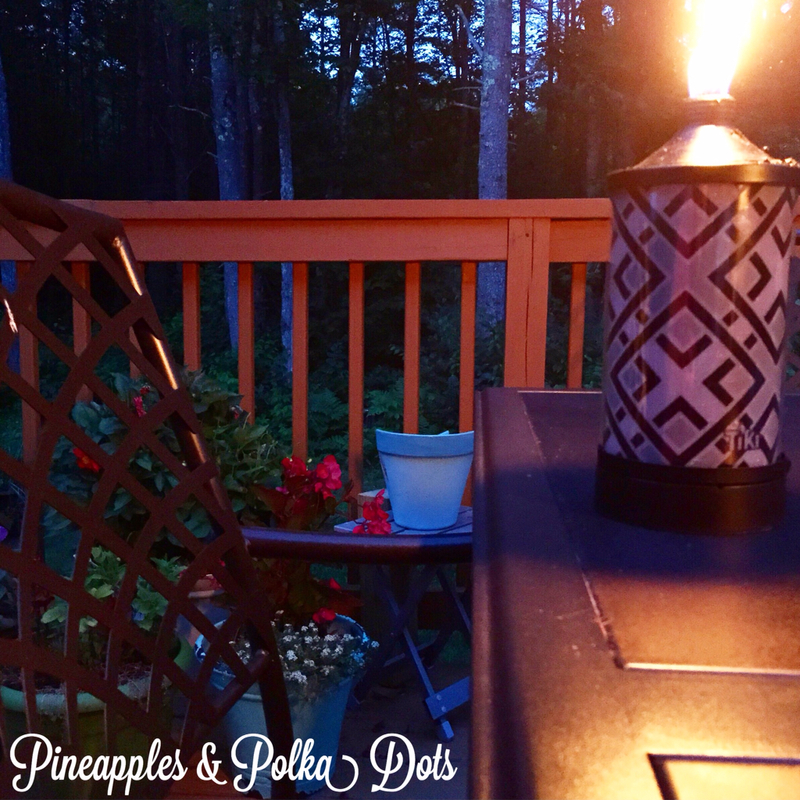 We live so close to so many great spots, and it is such a peaceful way to spend an evening. 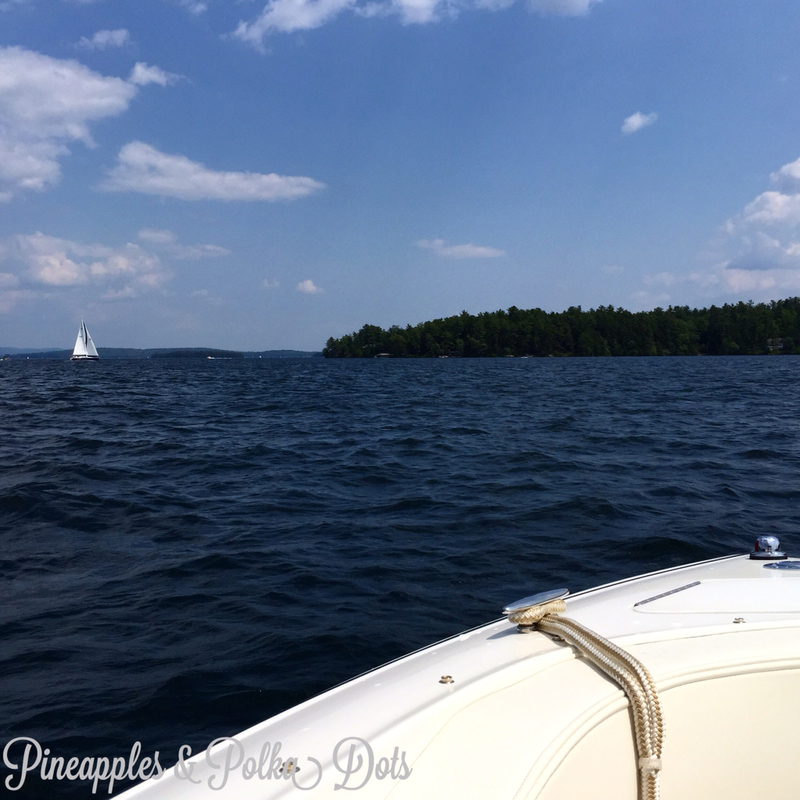 This summer is the first summer that I'm back into blogging, too, so a big project on my list is to keep on keeping on over here! I am so thankful to be back in the blogging world (I blogged about planning our wedding, but then didn't keep up afterward), and am loving all of the time I have to get creative and share with all of you. Speaking of creativity, I have a handful of projects I want to do, too! I am currently working on ideas for making a big clock for our dining room... Stay tuned for that! I also have a button monogram project up my sleeve, and maybe a few other things, too. 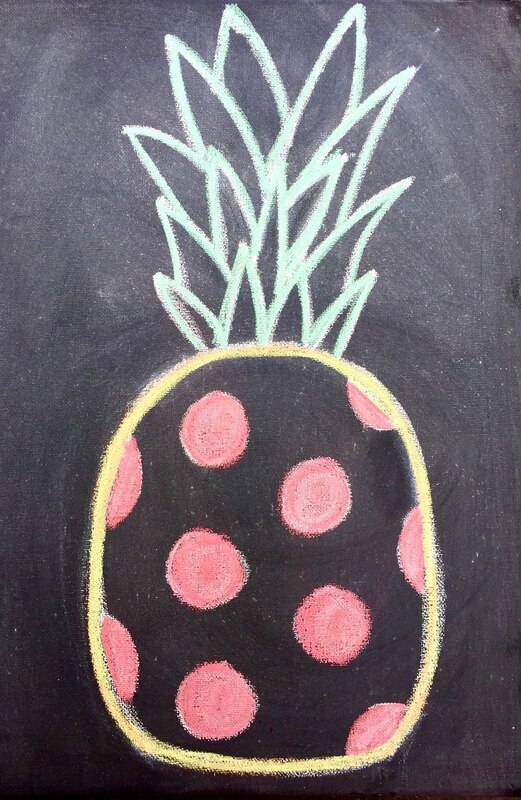 Summer is so busy, that I haven't gotten crafty with it for a while, but I definitely have some things planned! Okay, so so far, this is a pretty uneventful bucket list. One thing I DO want to do, that's a bit out of my comfort zone is try paddle boarding. We live pretty close to a lake, and there is a place nearby that rents them. I have always been curious about them, and really want to give it a try! What's on your summer bucket list? Have you crossed anything fun off yet? Let me know in the comments below! 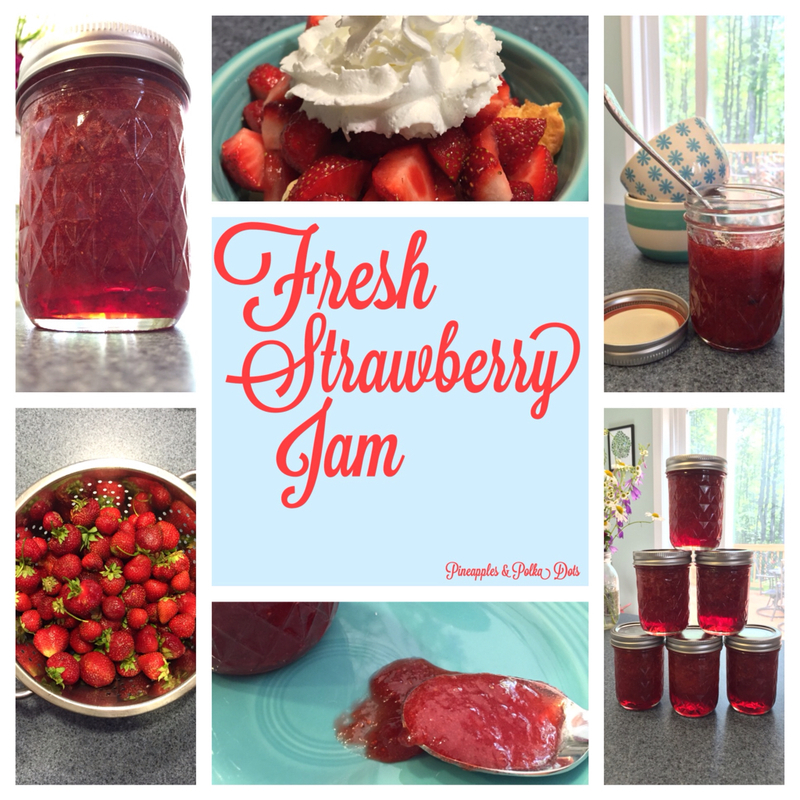 Homemade Fresh Strawberry Jam, Strawberry Shortcake, and Crepes- Oh My! Hi, friends! I think it's safe to say, we are totally loving summer. 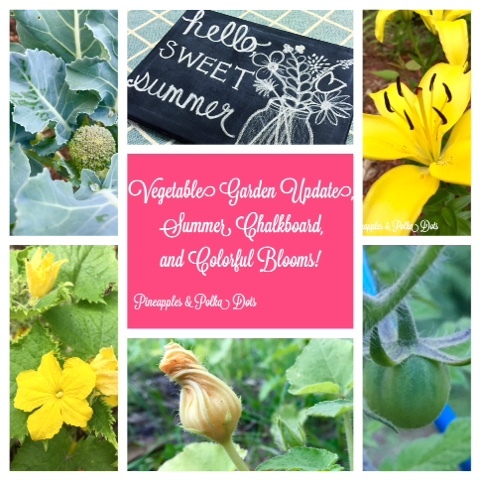 We have been taking all kinds of fun trips, gardening, and having plenty of fun. I am so thankful for all of the time we spend together in the summer, since the school year, with school, coaching, and grad school is such a whirlwind. Summer school is in session, but it's a part-time schedule, which is pretty awesome. I love to peruse the summer craft fairs that pop up in our area all summer long. The benefit of living in a semi-touristy area because of the fun things that happen during the summer! 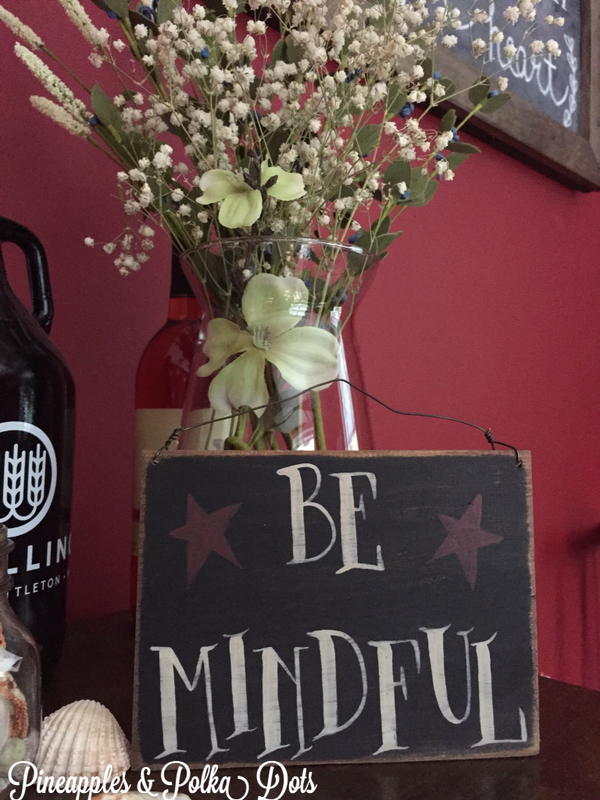 Last weekend, I picked up a couple of painted wooden pieces- one plaque that says, "be mindful", and a stenciled pineapple hook plate. I love the reminder of mindfulness and purpose. I don't know about you, but we've had quite a few rainy days in the past weeks. This has caused lots of growth in our gardens, which is great when we're talking flowers and veggies, but not so much with weeds! Seriously, don't judge the weeds, okay? Awesome. Happy Sunday, everyone! I hope you all had a great weekend, and if you live in the U.S., happy Fourth of July! 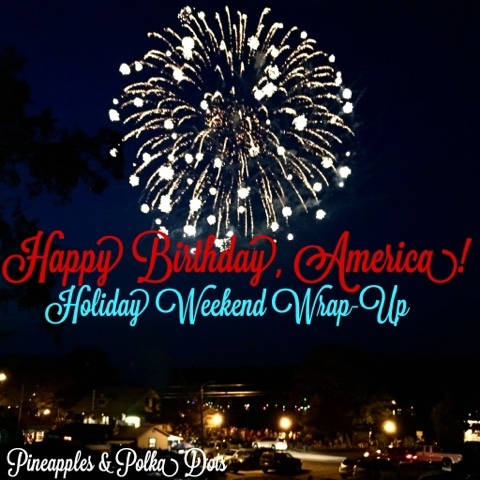 We had a fantastic holiday weekend, jam packed with family and friends, and celebration and fun! We had a productive week off, completing a few things on our to-do lists, some of which I'll be sharing soon! Rich and I both work in the special education field, where we have many people working with us in our classrooms. I have always said that I could not do my job without the support, collaboration, and teamwork of the wonderful ladies who work in my room! Each year, I try to show my appreciation with a little gift for each of my coworkers.